The popular Maxtrix Single over Single Bunkbed with Angled Ladder, Slide, Underbed Curtain and Top Tent remains a top choice with our youngest of customers. The popular Maxtrix Single over Single Bunkbed with Angled Ladder, Slide, Underbed Curtain and Top Tent remains a top choice with our youngest of customers. 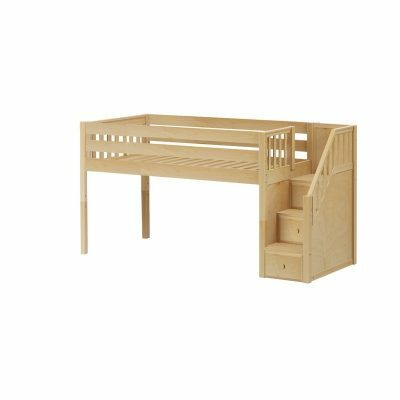 This model is part of the versatile Maxtrix System, perfect for families who want to reconfigure as their children grow. BUNK BED COLORS: White, Natural or Chestnut finishes. 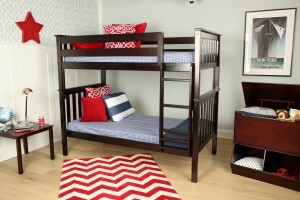 BUNK BED MATERIALS: Premium, select-grade solid hardwood beds for years of beauty + durability. 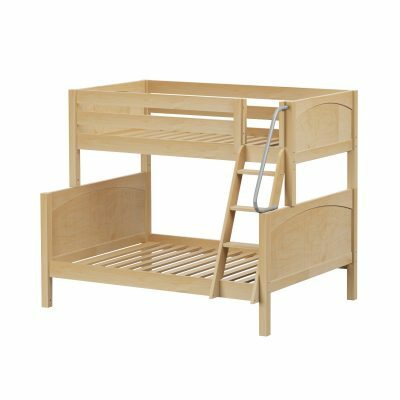 BUNK BED ACCESSORIES: Fun, themed accessories and tents for toddlers and young children – Ladders + slides to make bedtime fun and trundles for guests and sleepovers; Toy chests, dressers, cubbies and underbed bins for storage;Lofts, bookshelves, desks and tables for studying and organization. 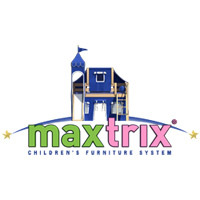 BUNK BED VERSATILITY: Maxtrix beds grow with your child from their toddler years through their teens. Toddlers and small children: Tents, tops or castle themed beds. Your little knight or a princess will look forward to bedtime in their own private hideaway. Simply remove the fabric tent and change the fabrics to more age appropriate ones. School years: Make a study area quickly and economically by making a single bed into a loft. Create a study area underneath with the addition of a desk and bookshelf or free up more space in the room with the addition of dressers and cubbies. Older children will appreciate trundles when friends come over to study and want a place to stretch out.